"We Didn't Get everything we wanted, "...But they finally agreed with us on all the principle issues"
"We Didn't Get everything we wanted", sighed HV Homeowner Palma Sales after an 11th hour settlement with Chubb Attorney Marc Markel on behalf of Huntington Village Community Association in Southwest Houston. "...But they finally agreed with us on all the principle issues"
After years of arguing ratification, CAI Attorneys Marc Markel, Clayton Hearn and HV Board President Lee Meister acknowledged that Johnson and Sales were liable only for the HVCA Annual assessment as actually recorded in the Harris County Real Property Records; $96 per year. $96 Cap on the Annual Assessment unless the Deed Restrictions are properly amended. Complete access to the Huntington Village Association's Books and Records. 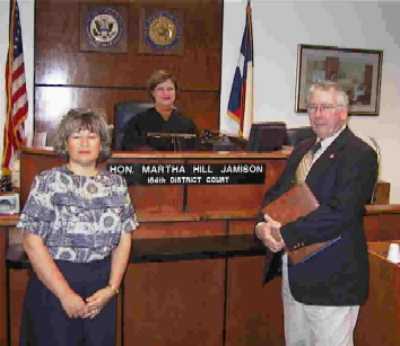 The lawsuit, Johnson & Sales vs Huntington Village Community Association has been ongoing since 1999 and was scheduled for a Houston Jury Trial to begin the next morning. "This issue was never about $48", explained Homeowner Johnny Johnson. "This has been a Principle Based Issue from Day One. The HV Board did it the wrong way and today it caught up with them. I only hope it makes them think before they do it again." In 1984 the Huntington Village Community Association (Southwest Houston) voted during an annual meeting in favor of a one year "Special Assessment" temporarily raising the $96 maximum annual ceiling on the assessment to $144. A "Special Assessment" for a capital expenditure is allowed only if a majority of 10 percent of the community agree with a vote in person or by proxy. This "Special Assessment" can only be valid for a maximum of one year. To increase the annual assessment beyond one year, the deed restrictions would require amending. Huntington Village deed restriction may be amended, but purposely this process requires "an instrument SIGNED by not less than 75%" of lot owners which must be recorded. (Recording requires that signatures be notarized). The following year, 1985, the HV Board, pretending the assessment ceiling had been lifted, continued invoicing amounts beyond the maximum limit allowed. This action produced complaint after complaint from individual homeowners who began asking questions. If a homeowner asked how this happened, he would normally be told that a vote took place in 1984 and everything is fine. If you asked for proof of that election you would then hear "well.... we did not get all the votes then, but we are working on them..." To go beyond these questions, a homeowner found he would be marked and targeted for special treatment. For those who may think this issue is about money, nothing could be further from the truth. This issue is not about money. Forty-Eight Dollars is not the issue in question. What is at stake is our community and our faith in the character of those we appoint to protect it. If an elected board cannot operate within the provisions of our governing documents and must cover it up using our own lawyer and our money against us when $48 is in question, then how long will it take to make that figure $480? ..... or $4800? What is Your Stopping Point? When will YOU say ENOUGH is ENOUGH? HV's recorded deed restrictions call for a maximum limit of $96/year and has never been amended. (Amending the Deed Restrictions today requires a 75% lot owner vote) In 1984, a special provision was made allowing for a "special assessment" increase of 50% or $144 for a single year. During the years following, the board, in violation of our governing documents decided to continue billing the $144 annual assessment under the "fraudulent guise" that our Deed Restrictions had been amended and "they needed the money". A vote had indeed been taken, but a "Special Assessment" must be for a capital expenditure and can only be valid for one year. A "Special Assessment" does not constitute an amendment to our Deed Restrictions. ".....No Documents Exist to Legitimize the Increase....."